VESA standard Flat panel monitors (up to 21”) can be positioned up and out of the way – yes exactly where need with the space saver monitor arm MARMGUS20T from Thanko Corporation. The Flat panel space saver monitor allows to place your flat panel monitor anywhere on desk for space-saving, comfortable viewing –up to a depth of 105mm.The height of the monitor can be adjusted with the steering wheel easily by any one. As the steering wheel is placed on top it is very convenient and practical to adjust the height. The Monitor cable is smartly connected to the PC and no need to worry about the cable getting struck while adjusting the monitor. The arm rotate more than 180 degrees, tilt up to 90 degrees in all directions, and allow rotation of monitor from horizontal to vertical. 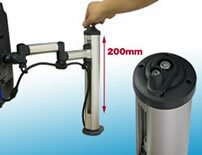 The arm fits desks 1cm – 7cm thick and holds up to 10kg. 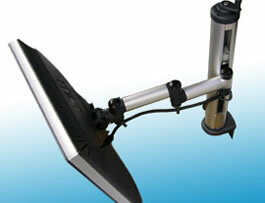 The space saver monitor arm MARMGUS20T is available for approximately 11,800 Yen ($101).